A sign of Good Times to come? - OFFSIDE ! Heard a conversation in a public vehicle: God must be Nepali. For he made sure we dowell in two sports in a single day. Needless to say, the person inquestion was talking about Nepali football team’s performance against Jordan (2014 FIFA World Cup qualifiers) and U-19 cricket team’s start in ICC U-19 WorldCup qualifiers. Yes,Nepali Colts beat Afghanistan convincingly. Most were expecting the result, maybe not with such a margin though. But in another case, Jordan advanced to the group stage of the qualifiers, beatingNepal by a huge margin. 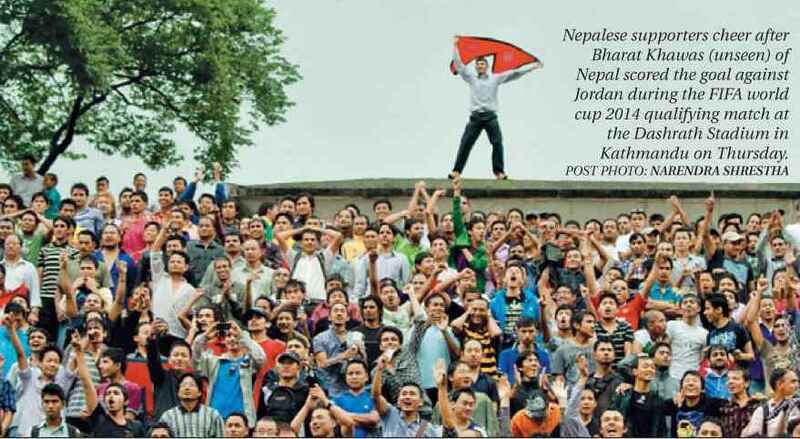 The scores, in aggregate, stood at 10-1 in favor ofJordan, while Nepal managed merely a draw at home. So what’s the fuss about? A draw? However,if you look carefully, there is a reason for joy, for elation, for exuberanceand for deciding which nationality God has. For, the draw followed a drubbing.And for the fans, a draw was as good as a win. It was almost a rise from theashes à la Phoenix. For the die-hard fans, there are many lives lost andgained in those 90 minutes that their stars sweat it out. Forgetfans, how many ‘realistic’ pundits would have given Nepal a 1-1 draw, atDashrath Stadium, after a 9-goal storm hit them in Amman. The realists always ask you: What do you do when youhave your back pushed to the wall? …when you hit the rock bottom? For theorists, the answer may be simple: Bounceback. But then, only those who face the situation know that it’s always easiersaid than done. They say, nothing succeeds like success. The corollary is alsotrue. Failure also breeds its own kind. When your back is to the wall, youstart taking support of that wall. It becomes your companion, and you startfinding some comfort in it. You start going though the motion… run-of-the-millstuff. So much that you start enjoying it, making it difficult for you to comeback. At such moments, it is necessary to break thethought process. Once that chain is broken, parity can be restored. In thiscase, Nepal’s climb in FIFA ranking must have helped. After all, we became thenumber one football side in South Asia. Some pride restored off the field. Apparently, following the 9-0 humiliation, Nepal’sBritish coach had told the boys, “You don’t become a bad player after onegame.” Inspiring? Maybe, but the coaches don’t go and play. It’s for theboys to face the heat. Evenin pre-match press conference, Roberts was quoted as saying that they (theteam, including himself) wanted to put pride back into Nepal and want to pleaseeveryone. The captain, however, sounded more circumspect, not promising much.Somehow, the fans were worried. “Are the players in right frame of mind toplay this game,” they wondered. Butonce the match started, worry was put to rest. The boys were in the zone andfelt at home. The fans could do their job – cheering. In sport, as in life,some questions are answered only through actions. Goingto Amman, to play the first leg, Nepali team was underprepared, under-practicedand showed lethargy on the field. The football administrators should take someblame for that, for they know in advance when the national team plays. And theyare supposed to prepare them for big matches. Nothing big about that, it’stheir job. Amazingly,not much changed in 5 days – after match in Amman, but the result did. Onething that changed was that the players realized or made to realize why theywere playing – for their shirts. And the performance was there for all to see.Some would like to call it moral victory. SouravGanguly, the person credited to make Indian cricket team a fighting unit, saidonce, “I do not understand the meaning ofmoral victories.” But then, that was Indian captain talking. For fans,that’s what it is all about. And for the players, maybe they can take a leaf outof their coach’s quote and remember – You don’t become a great player after onegame, either. Could it be just the start we needed? 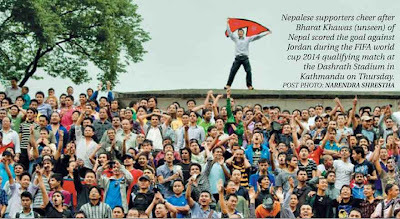 Disclaimer: The picture shown in the post is courtesy www.ekantipur.com. It was published in the The Kathmandu Post epaper.